Q.1 How can I claim GST refund of excess amount available in Electronic Cash ledger? Q.2 What is the amount limit for claim of refund in case of “Refund of excess amount from the cash ledger”? Q.3 What are the relied upon documents which I have to upload with refund application on account of excess payment of tax? Q.4 To whom should I file my application with? Q.5 Can I save the application for refund? Q.6 Do I need to upload any statement for claiming refund? Q.7 Can I preview the refund application before filing? Q.8 How can I track the status of application for refund? Q.10 How can I download the ARN? Q.11 Where can I download my filed refund application? Q.12 What happens when refund application in case of “Refund of excess balance from Electronic Cash Ledger” is filed? Q.13 Whether there is any ledger entry on filing refund application? Q.14 When / how will the refund Form RFD-01A be processed? 1. Login to GST portal for filing refund application under refunds section. Select the reason of Refund as ‘Refund on account of excess balance in cash ledger’. File refund application in GST RFD-01A. 2. The amount available in Electronic Cash Ledger would be auto-populated in the refund application in a matrix. Mention the amount of refund to be claimed in GST RFD-01A in refund claimed table and file the form. 3. Once Application Reference Number (ARN) is generated, take a print of ARN and submit to the Jurisdictional Authority manually. Ans: There is no minimum limit restriction for refund of excess amount in Electronic Cash Ledger. Ans: You have to upload documents as are required to be filed along with Form RFD-01A, as notified under CGST Rules or Circulars issued in the matter and other such documents the refund sanctioning authority may require. Taxpayers have an option to upload 4 documents with the refund application, of size up to 5 MB each. Therefore, any supporting document can be uploaded by the taxpayer, if required. Ans: The taxpayer shall file the refund application in Form GST RFD-01A on GST portal. Taxpayer shall choose ground of refund as “Refund of excess balance in Electronic Cash Ledger” for claiming refund. After filing, refund application shall be assigned to Refund Processing Officer and refund applicant can track the status of refund application. Ans: Application for refund can be saved at any stage of completion for a maximum time period of 15 days from the date of creation of refund application. If the same is not filed within 15 days, the saved draft will be purged from the GST database. Note: To view your saved application, navigate to Services > Refunds > My Saved/Filed Applications option. Ans: No statement template is available for claiming refund. You need to mention the refund to be claimed details in the refund application screen while filing refund application. Ans: Yes, you can preview the refund application in PDF format to check for any inconsistency or discrepancy before filing on the GST Portal. Ans: To track your filed application, navigate to Services > Refunds > Track Application Status option. Ans: Once the refund application is filed, Application Reference Number (ARN) receipt would be generated and ARN would be sent to your registered e-mail address and mobile number. Ans: To download Filed applications (ARNs) PDF documents navigate to Services > Refunds > My Applications command. Ans: Navigate to Services > User Services > My Applications link to download your filed refund application. GST Portal generates an ARN and displays it in a confirmation message, indicating that the refund application has been successfully filed. GST Portal sends the ARN to e-mail and SMS of the registered taxpayer. GST Portal also makes a Debit entry in the Electronic Cash Ledger for the amount claimed as refund. Ans: Yes, there is a debit entry in Electronic Cash Ledger for the amount claimed as refund. The ledger entry would be posted to Electronic Cash Ledger only after filing of refund application. Ans: Once the ARN is generated on filing of refund application in Form RFD-01A, the refund application along with the documents attached while filing the form would be assigned to Jurisdictional Refund Processing Officers for processing the refund. Tax payer can track the status of refund application using track status functionality. The application will be processed and refund will be disbursed by the Jurisdictional Authority after scrutiny. How can I file the application for refund of excess balance in Electronic Cash Ledger on the GST Portal? 1. Access the https://www.gst.gov.in/ URL. The GST Home page is displayed. 2. Click the Services > Refunds > Application for Refund command. 3. The Select the refund type page is displayed. Select the reason as Refund of Excess Balance in Electronic Cash Ledger option. 4. Click the CREATE button. 5. 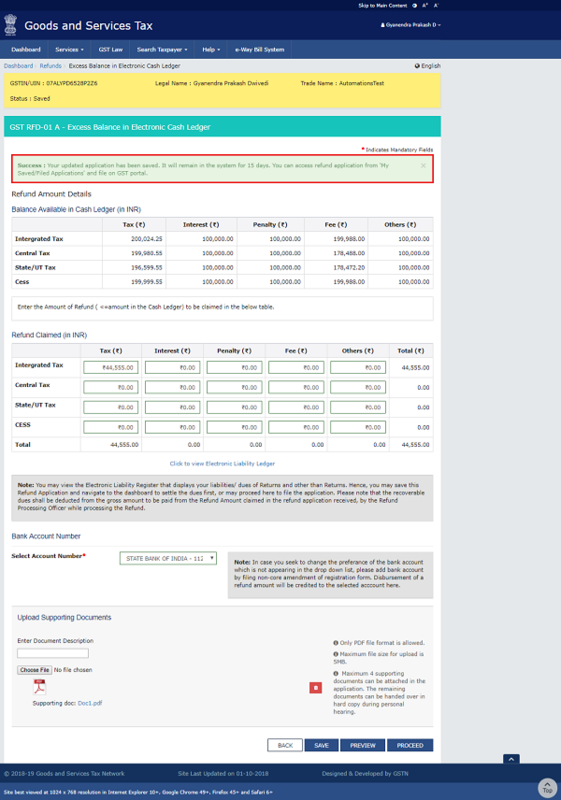 The GST RFD-01 A – Excess Balance in Electronic Cash Ledger page is displayed. 6. 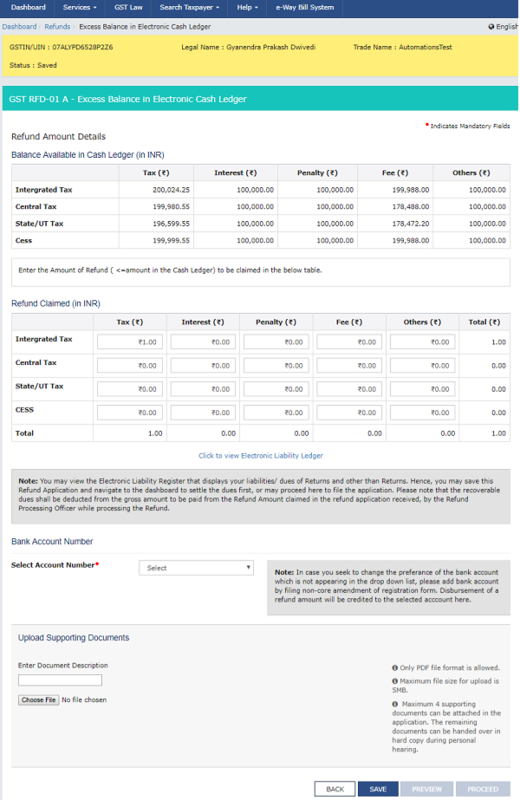 Balance amount available in Electronic Cash Ledger is displayed. 7. Enter the amount of Refund to be claimed for Integrated Tax, Central Tax, State/ UT Tax and Cess in table “Refund Claimed”. 8. 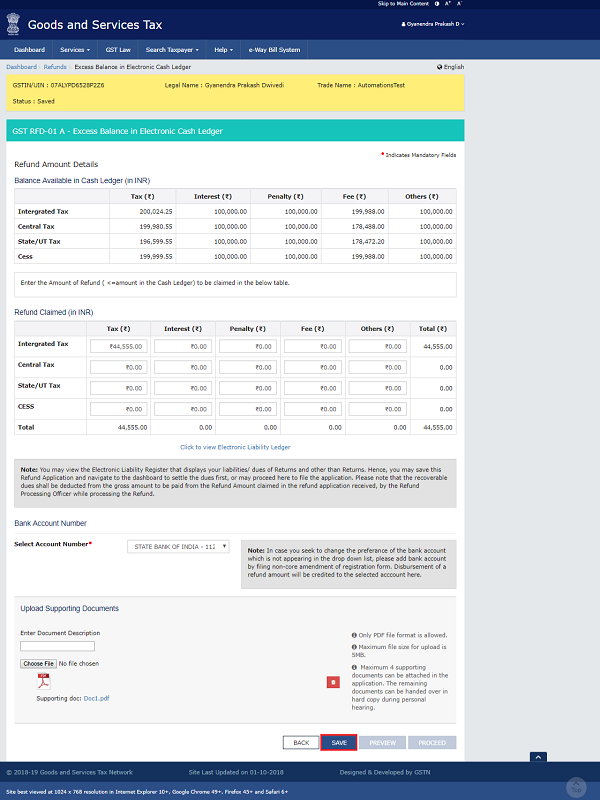 You can click the hyper link Click to view Electronic Liability Ledger to view details of Electronic Liability Ledger that displays your liabilities/ dues of Returns and other than Returns. 9. Click the GO BACK TO REFUND FORM to return to the refund application page. 10. Select the Account Number from the Select Account Number drop-down list. 11. Under section upload Supporting Documents, you can upload supporting documents (if any). 12. Enter the Document Description. 13. Click the ADD DOCUMENT button. 14. Click the Delete button, in case you want to delete any document. 15. Click the SAVE button. 17. Click the PREVIEW button to download the form in PDF format. 18. Form is downloaded in the PDF format. 19. Click the PROCEED button. 20. Select the Declaration checkbox. 21. In the Name of Authorized Signatory drop-down list, select the name of authorized signatory. 22. Click the FILE WITH DSC or FILE WITH EVC button. 23.1. Click the PROCEED button. 23.2. Select the certificate and click the SIGN button. 23.1. Enter the OTP sent to email and mobile number of the Authorized Signatory registered at the GST Portal and click the VERIFY button. 24. The success message is displayed and status is changed to Submitted.Application Reference Number (ARN)receipt is downloaded and also sent on your e-mail address and mobile phone number. Click the PDF to open the receipt. The system generates an ARN and displays it in a confirmation message, indicating that the refund application has been successfully filed. Filed applications (ARNs) can be downloaded as PDF documents using the My Saved/Filed Applications option under Refunds. Filed applications can be tracked using the Track Application Status option under Refunds. Once the ARN is generated after filing of form RFD-01A, taxpayer needs to take prints of the filed application and the Refund ARN Receipt generated at the portal, and submit the same along with supporting documents to the jurisdictional authority. The application will be processed and refund will be sanctioned manually. The disbursement is made once the concerned Tax Official processes and sanctions the refund application. 25. ARN receipt is displayed. 26. Navigate to Services > Ledgers > Electronic Cash Ledger to view the debit entry in the Electronic Cash Ledger for the amount claimed as refund. 27. The Electronic Cash Ledger is displayed. Click the Electronic Cash Ledger link. 28. Select the From and To date using the calendar to select the period for which you want to view the transactions of Electronic Cash Ledger. 29. Click the GO button. 30. The Electronic Cash Ledger details are displayed. Notice the debit entry in the Electronic Cash Ledger for the amount claimed as refund.